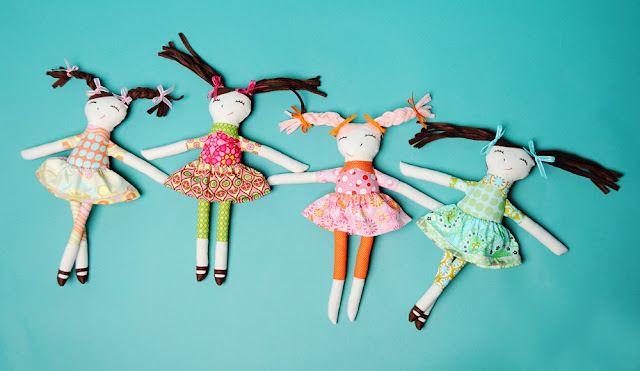 Grosgrain: Sew Much Ado Ruby Lou Doll AND Pattern GUEST GIVEAWAY!!!! CLOSED. 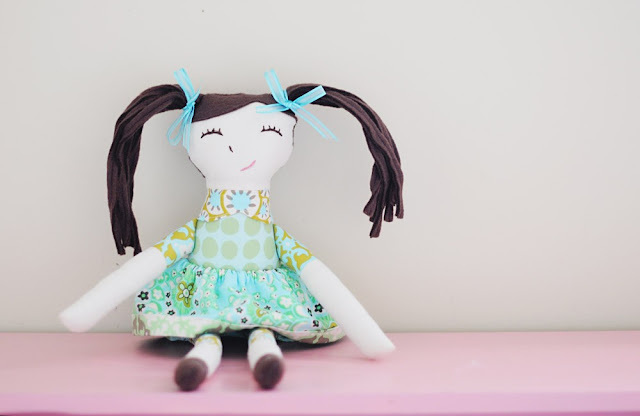 Sew Much Ado Ruby Lou Doll AND Pattern GUEST GIVEAWAY!!!! CLOSED. 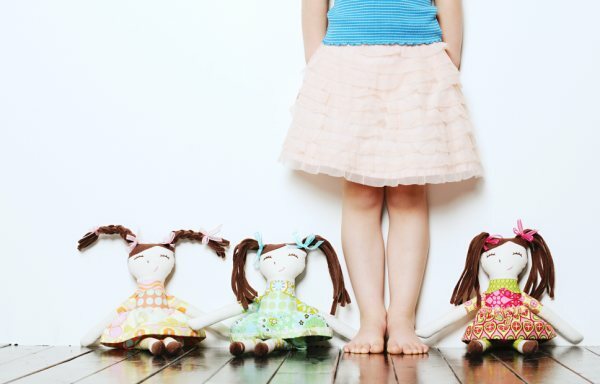 Homemade dolls are so much sweeter than store bought. There's a personal feel that separates them from other dolls. 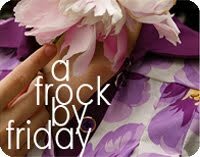 Most recently, Abby of Sew Much Ado, has found her new passion, pattern designing. She found that it's the best way to share her love of sewing and designing with others. Happily she is offering TWO lucky Grosgrain readers a piece of her sewing efforts. One lucky reader will receive a ready made doll, handmade by Abby. 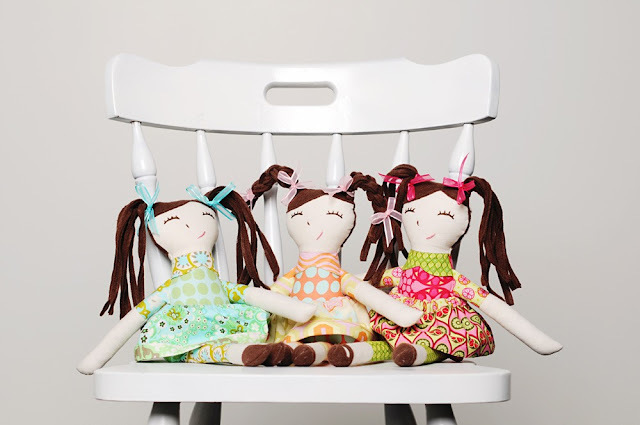 One more lucky winner will receive a PDF pattern to make Ruby Lou Dolls of their own. Just leave a comment indicating whether you would prefer the doll or the pattern or either. Make your very own Ruby Lou Doll! Ruby Lou is 17” tall and has attached shoes. As a bonus, this pattern also includes a reversible skirt pattern! Your little girl will love her new playmate. This pattern is a fun project for the beginner to intermediate sewer. Beginner embroidery skills are also required. This is a PDF pattern and includes detailed instructions with color photographs and full size pattern pieces – no need to fuss with enlarging pieces. The Ruby Lou Doll Pattern is the first available, and more are to come in the near future. Abby has loved sewing since she was a little girl and never stopped. She grew up sewing her own clothes, and now that she is a mother, she sews less for herself and more for her two sons. Also, check out her sewing blog for lots of tutorials and sewing tips at sewmuchado.blogspot.com. Love this doll! I've been looking for just the right thing for my girls. Would love to win either the already made or the pattern. I would love to win this!! These dolls are adorable! I want the doll please! Oh i've got my fingers crossed!! They're so cute!!! This is such a cute doll!! I need it!! I would love to win the pattern. The dolls is great! I would love to make these for my girls! and posted on the blog as well! such cute dolls! i would love to be able to make these! i would love to win the doll. So cute. My girls would love this! Sweet! I love dolls like this, so much personality. Doll or pattern would be lovely. I would love to have either. Such an adorable doll. Cute! I would prefer the pattern. Ooo so cute! I'd love to win either :) Thanks!! Would love to win the doll for my baby girl. Thanks for offering this great giveaway! I would love a pattern, beautiful! these dolls are adorable. i recently made some similar, but had a little different look and did not have the loose skirt. i would love the pattern. I love this doll (and the pattern!). My little girl -- Ruby Mae, coincidentally -- is due any day now and I'd love for this to be one of her first toys! Super sweet dolls. Would adore either the doll or the pattern. And I really love/want/need the pattern! Cute as a button! I think I'd like the pattern. I would love to win the doll! She is adorable! Those are such cute little dolls! The Doll...please! I'm sewing impaired, so the pattern wouldn't do me any good. so cute! I would love either the pattern or the doll. I can see myself making these for my girls. I love your dolls, so cute! I would be thrilled to receive the pattern! I love this doll and have a brand new baby girl that will grow up to love this! My littlest girl would love to have a Ruby Lou doll. They are the cutest ever! Lovely doll! Everyone will want to be a winner. I would love to create one for my precious Granddaughter. I linked! I would love the pattern! I linked my blog to yours, and I thought I'd leave a comment too! MY daughter is about to turn 5 and when she saw these dolls she just loved them! We would love to win one! Those dolls are so adorable! Very Cute! I'd love a pattern to make one that looks just like my soon to be 4 year old. So cute!! I would love to make one of these for my darling grand-daughter! So cute! I'd love to win either the doll or the pattern! i LOVE these and woudl love to win either... so adorable! I would LOVE to win this doll! Abby is so talented and my girls would LOVE playing with this! I would love to win the doll! They are great! This is very sweet. I would love to have a pattern to make my daughter a look a like! I love this doll and would love to win either the doll herself or the pattern! Ohhhh, I want both. But if I have to choose??? What precious little dolls. Handmade rocks! I would love the doll for my girls! these dolls are just perfect. would love a chance to win. WOW! I would love a PDF to have a go! so adorable. 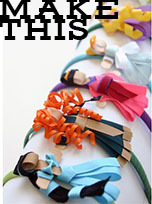 i would love to have the pattern to make a bunch for my little nieces!! I'd love either one- a pattern or a doll! so cute. my daughter would LOVE these adorable dolls! Yummy!!! I posted this on Twitter too!! I would love to have a little Ruby Lou for my baby girl! the patterv- or dollare adorrable! i would love to win oneof them! so cute . . . my 3 girls would love a doll like this!!! the pattern would be so wonderful!!! I want the doll--really I need two because I have a daughter now and one on the way--but one is a good start. This doll has so much personality it is almost too cute! I would love either doll or patern. This doll is just so adorable!! Awwww, how sweet are those dolls!!! ADORABLE!! Although I really want the doll with pink hair for myself, I'd love the pattern the most so I could make the dolls for my nieces! I would love to win a doll - thank you for another great giveaway. Best to you during your delivery and CONGRATULATIONS!! This is the cutest doll! I would love to have the pattern so I can make one!!! I would love the doll for my little girl! So cute and I love the fabric choices! So Adorable! I'd love to win this for my baby girl! Pattern or doll either would be wonderful! SOOOOOOOOO cute! I'd love to win either! 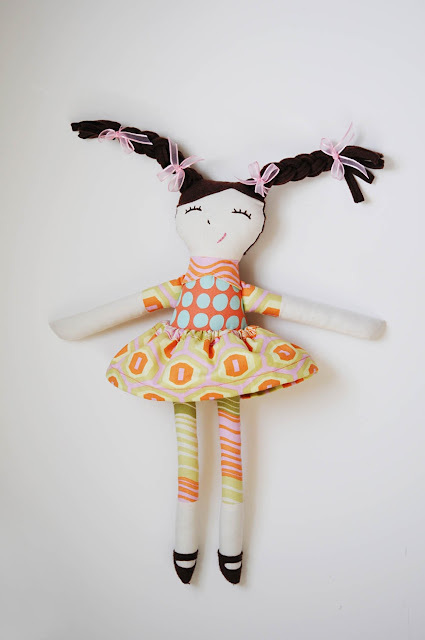 I would love the pattern to create my owm ruby lou doll. Her hair is soo, cute. She'd be an awesome to gift to a little girl with matching skirts for her and miss ruby. Here's a link to my blog I posted about the give away. This doll is adorable. I would love either the pattern or the doll. It would be the perfect little doll for any little girl. Such a cute doll! I would love the pattern! So cute! I want both, the doll and pattern! Wouldn't it be great if we could all make at least one doll to send to Haiti? It would mean so much to so many right now. oh i would love to win this pattern. 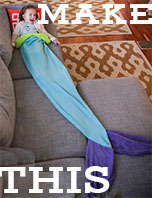 Oh, my daughter ONLY likes softie dolls (and I think they're the cutest, so it's a win-win)... We'd love to win-win one! someone to love and share happy moments with. Very precious and the clothes they wear are adorable. I'd love to win a doll! First time reader here. i would love to win the pattern, so i can make them for my 3 girls. I would love to win one of these adorable dolls so that I can gift it to my beautiful niece and her precious little girl. They adore your dolls!! These are just simply adorable! They would make any little one smile! Just what I need for my daughters birthday coming up so cute! I would love to win the doll...it is absolutely adorable! What a perfect "friend" for a little girl! I'd love a doll. 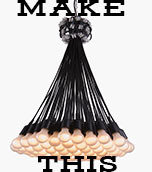 I'd like to try to make one but I'm not sure I'd be able to. SO ADORABLE!! I just love these dolls! A very very cute idea! I would LOVE to win the pattern or the doll! I love it! So so cute! I would love to win either the doll or the pattern! I STINK at sewing! The doll please! I have a daughter and a niece that would just love these customized for them! Hope this wonderful giveaway is still running as the dolls are gorgeous! Pattern would be great but one of her actual dolls would be even better. Oh My Goodness these dolls are adorable! I would love to win with a doll or the pattern. These dolls are too cute! My little girl loves dolls these days. I'd love to have either the doll or the pattern. Thanks for the giveaway! I love this doll! SO ADORABLE! I don't know if this is too late, but I'd love to win either, but more preferable the already made one because I love the fabrics you use! I choose the doll, ready to play with. So sweet, what a great idea! This would be the perfect 1st doll for my baby girl! would love to win either - thanks! Cute doll, my daughter would love her. That doll is so cute. Mind you the pattern would be great too! I have posted a link pn my blog to this link. I would love either! Waht a cute doll! How fun! These dolls are so cute I would love to win this. Thanks for the chance. Oh my goodness these dolls are adorable! My daughter Ava would love to play with them. So, I would be ecstatic with the doll or pattern to make her one. I will also post a link to my blog! What a cute dolls!!!!! Thanks for the chance!!! What lovely little dolls. This is a great giveaway! I can't find this pattern anywhere. Help! !